If you control no monsters, you can Special Summon this card (from your hand). You can only use each of these effects of "Super Quantum Red Layer" once per turn. ● When this card is Normal or Special Summoned: You can target 1 "Super Quant" card in your Graveyard; add it to your hand. 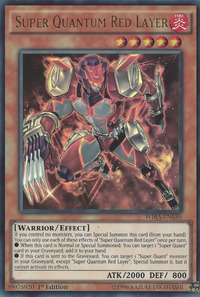 ● If this card is sent to the Graveyard: You can target 1 "Super Quant" monster in your Graveyard, except "Super Quantum Red Layer"; Special Summon it, but it cannot activate its effects. This monster appears in the artwork of Super Quantal Alphan Spike and Super Quantal Alphan Call.